Jordan Kenefick (left) and Torrie Bordes (right) enjoy hanging from the trees in Flagler College’s Palm Garden. Both students are freshman studying Graphic Design at Flagler. The bustling St. George Street, spanning far and wide through downtown St. Augustine, Florida, has just about anything a shopaholic can dream of. It was missing just one thing though when Daryl Drown first stepped foot onto the historic street—hammocks. Drown and his wife, Kristen, opened up Old City Hammocks on 4 St. George St. five years ago when they decided that what St. Augustine needed was hammocks and what better place to have a hammock store than on the ever-booming St. George Street? Daryl knew the only way a business like this would work was if it was exposed to major traffic. 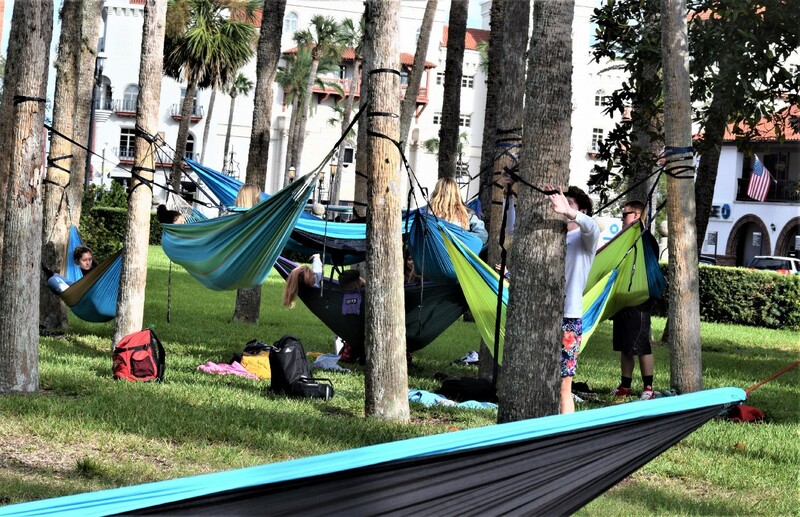 Students from Flagler College have made their way into Old City Hammocks where they’ve typically purchased the “more popular” travel hammocks, Daryl said. “Travel hammocks make up for probably 40 percent of our sales,” he said. And with only a handful of hammock stores in the country, Daryl said that their store carries more variety than competing stores, including REI. “We have a more diverse selection of hammocks than any place in the country—hands down,” he said. Hammocks have long been cliche symbols for tropical getaways and relaxation ads. Usually, they’re framed in a solitary white sandy beach setting with a fruity drink in-hand. In St. Augustine, a hammock setting can appear at any social gathering hanging from just about anything. “They’re another good way to connect with people in a relaxed environment,” Daryl said. “A social web of hammocks” forms inside Flagler College’s Palm Garden. Many of the hammocks pictured are traveler hammocks, which Deryl, an owner of Old City Hammocks, said are the most commonly purchased among students. Hammocks have made an eye-catching appearance in St. Augustine especially, in the Flagler College Palm Garden. More and more of these colorful cocoons are popping up throughout the nation’s oldest city and being hung from more than just trees. One Flagler College student, Ali Mulla, an off-campus junior, has found that his porch serves as a great foundation to hang his hammock up on. Aside from porch hammocking, there’s always the usual Palm Garden hammock-ers. Torrie Bordes, a freshman at Flagler College, is one of those “hanging” the Palm Garden location. She was inspired to join in on the hammock fun when she attended Admitted Student’s Day and saw other students at her soon-to-be school swaying in the trees. Now that Bordes has invested in her own hammock from Old City Hammocks, she’s come to her own realization of what having a hammock is all about. “It’s a chill time to hang out with yourself or make it social,” Bordes said. Be the first to comment on "Rock the hammock: relaxing in style"